Forehead wrinkles are the horizontal lines between your brow and hairline. These are caused by the contraction of the frontalis muscle. Over time, forehead lines can become quite deep and furrowed. The primary treatment for forehead wrinkles is botulinum injections (Botox® or Dysport®), where small quantities are placed across the forehead. 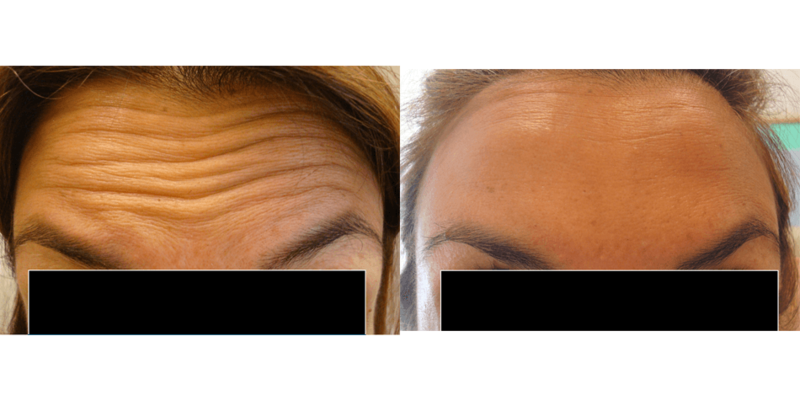 An advanced understanding of facial anatomy is required to treat the forehead, as a common side-effect from poor botulinum treatment in this region can result in a dropped brow; resulting in a more masculine or even ‘tired’ appearance. Dermal Filler (such as Restylane®, Juvederm® or Emervel®) can also be used effectively to treat deeper, more furrowed forehead wrinkles to give an immediate result. Often Dianna and Kirsty will consider using a combination of both botulinum and dermal filler, depending on the individual needs of the client.